Wella EIMI Styling Range ! I personally love experimenting with hairstyles myself and having the right hair products to assist in the process, is really essential. 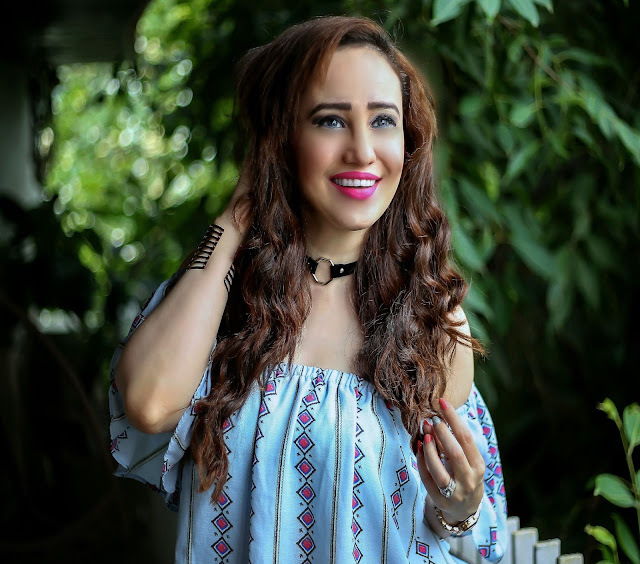 So today, I’m really excited to introduce a new range of hairstyling products that I have been using lately. 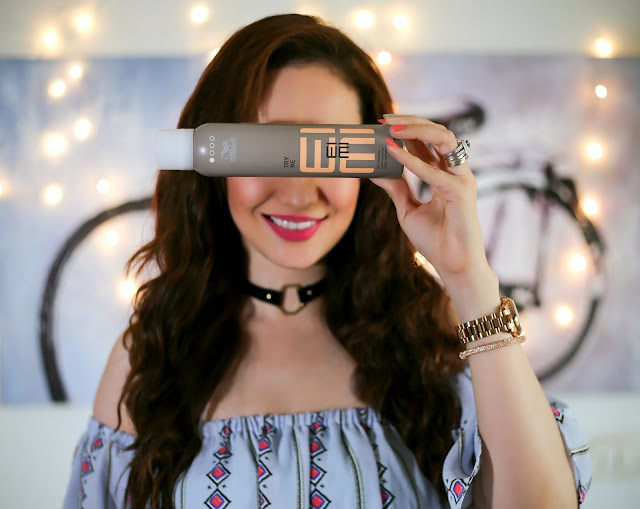 I’m talking about the NEW EIMI styling range launched by Wella Professionals consisting of 31 styling products to help create salon inspired hairstyles in the comfort of your own home. The Wella Professionals EIMI has exciting products to create all sorts of styles – with either wild texture, dazzling shine, a volume boost or a smooth and sleek finish. 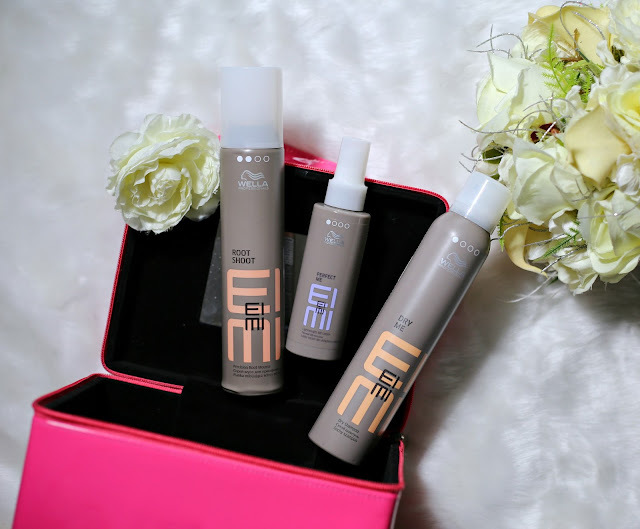 Today I’m going to review three products of the EIMI range that I have been using. Also check my last related haircare post with Wella Global Ambassador Patrick Cameron here. I am a big fan of dry shampoos. 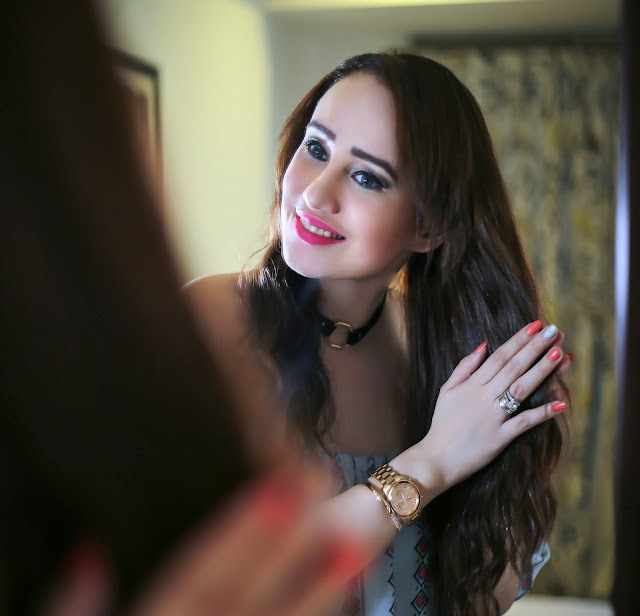 With busy work schedules and hectic weekend plans, I sometimes find it difficult to squeeze in time to wash my long tresses every other day. 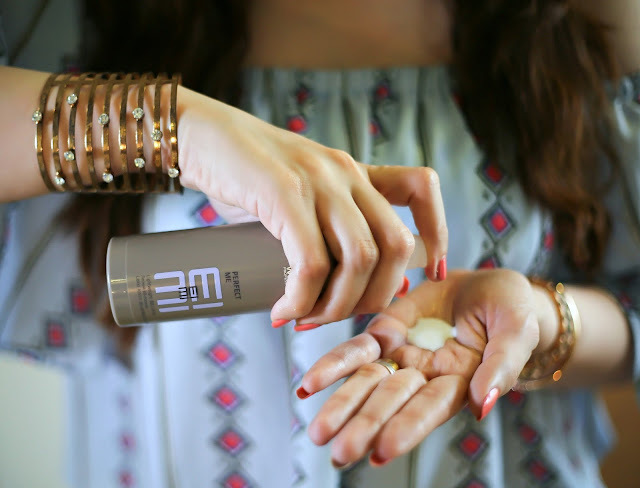 That’s where the EIMI Dry Me is a real saviour, with it’s Tapioca starch formula, it absorbs all the excess oil and greasiness from the scalp and leaves my hair feeling so fresh and smelling so divine. 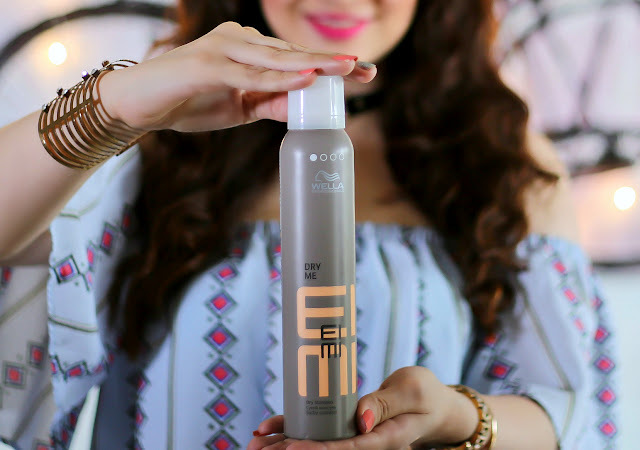 The EIMI Dry Me is perfect for creating head turning volume and has a matte texture. Just spray some of it on the roots, let it sit for about a minute or two and brush through. It works great without leaving a white residue on the hair. 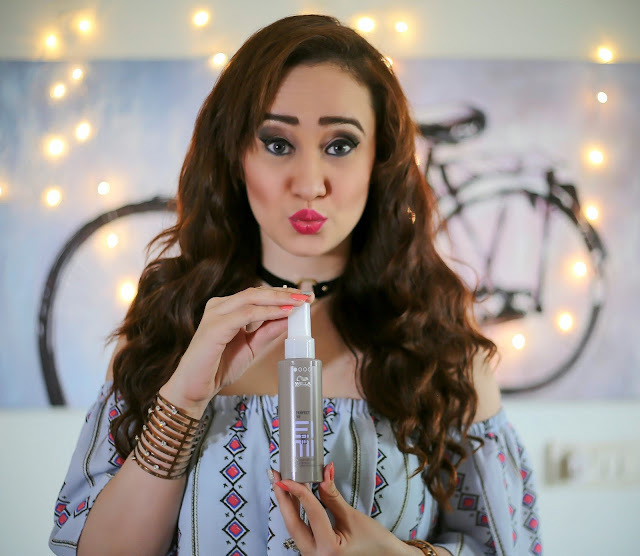 It is a real boon for people with oily scalps and a great plus is it’s lovely fragrance. This was my first time using a BB lotion for hair (like BB creams for the face) and I was quite intrigued to try it out and I must say I totally loved the results. This lightweight hair moisturizer not only gives your frizz free hair but also hydrates and moisturizes it. This lightweight lotion creates natural style with smoothness. The lotion also adds shine to the hair and also helps tame fly-aways. The best part of this lotion is that in this humid weather it is really lightweight, so unlike other hair serums, it does not weigh the hair down and make it greasy. 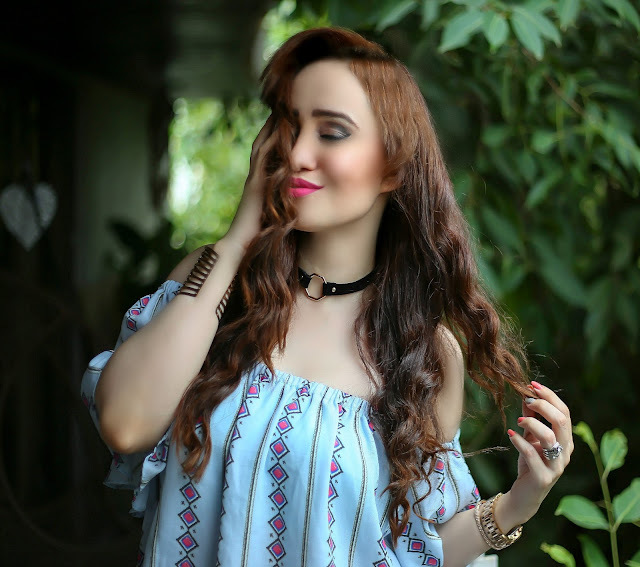 I use about two to three pumps of the product on the mid-lengths of my hair either on damp or dry hair. It is also a good heat protectant, so I also use it before I style my hair either with a straightener, blow dryer or curling iron. 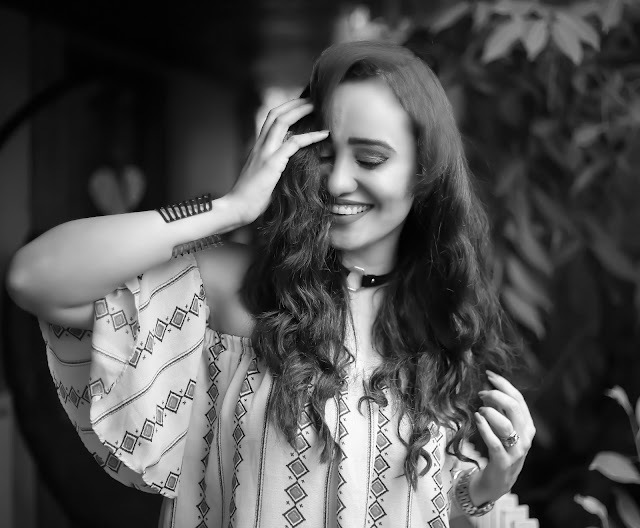 The length and thickness of my tresses, usually weighs my hair down and tends to make my crown of my hair look relatively flat. 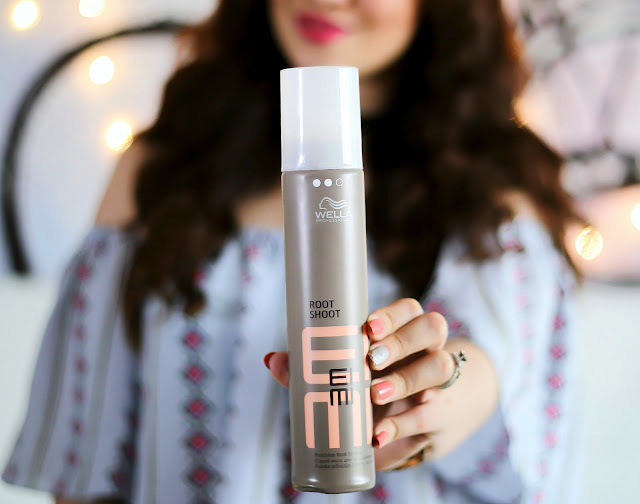 So the EIMI Root Shoot really works well for me and adds great volume at my roots and gives it a much needed lift. All you have to do is just take some mousse on your palms and apply it on your roots on damp hair and blow dry . You will immediately get insane amount of volume. I absolutely love the instant bounce it gives my roots. To create today’s hair style I first I sprayed some Dry Me dry shampoo through the roots of my hair, to remove excess moisture and add insane volume to my hair, then I applied the Perfect Me BB Lotion to the mid-lengths of my hair, to add shine and smoothness and also to act as a heat protectant, before curling my hair. Once my hair was curled I then sprayed some Root Shoot mousse on my roots and blow dried it for extra lift at the roots. I again used a some Perfect Me BB Lotion to tame the fly-aways. 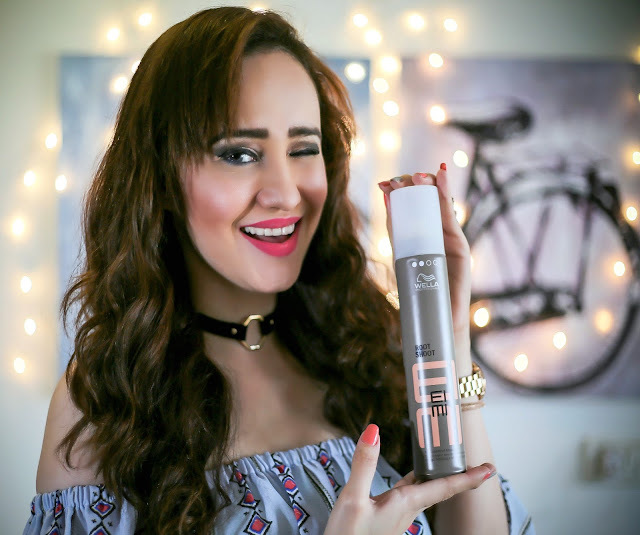 I absolutely loved the final look of my hair using these three EIMI styling products, I enjoyed my fabulous hairstyle with soft bouncy curls with insane volume and a perfect lift at the roots. 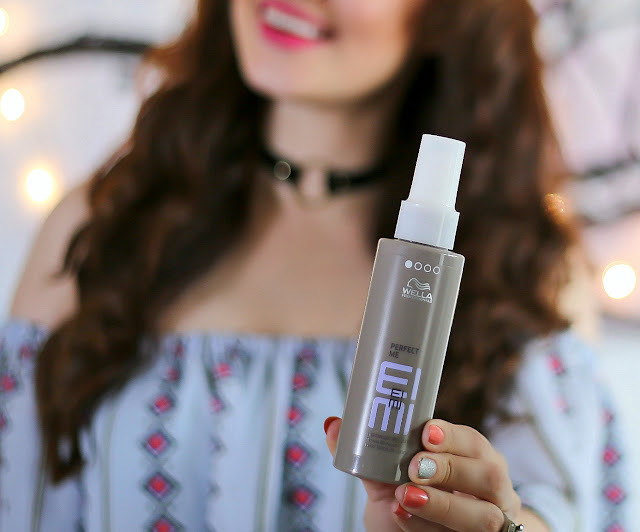 The EIMI range of styling products from Wella Professionals is now a regular feature in my hairstyling arsenal and helps me create glamorous salon like hairstyles myself. 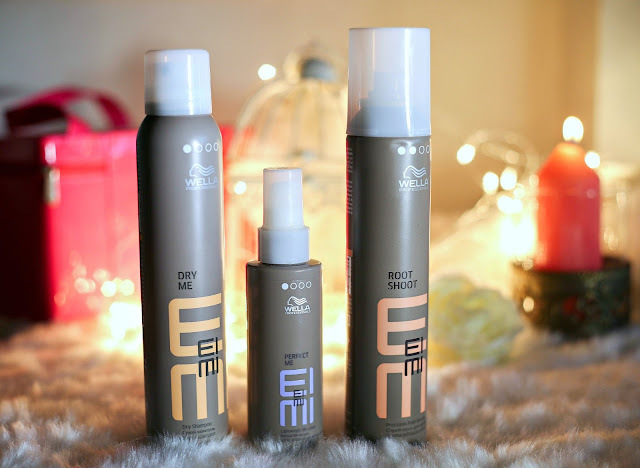 I absolutely love the three products I tried from the EIMI range, with the Dry Me being my favourite and I look forward to trying other products from the range too. I highly recommend trying out the new EIMI products, EIMI is available in all Wella Professional salons. Simply ask your Wella Professional stylist for more information.